For five years in the running, Interact Club has participated in Buddy Ball, a version of baseball modified for people with special needs. On Oct. 20, the club met at Eastmonte Park for their first volunteer event of the year. Buddy Ball gets its name from the “buddy system” that ensues between students and players; each Interact Club member is paired with a buddy who they help through the game. The game itself is similar to baseball in its dynamics, yet it is played without restricting rules. For example there are no strikes or outs, if the batter cannot hit the ball after a few attempts they simply pull forward a batting tee, everyone has the opportunity to run the bases and make a homerun, and no score is kept. By eliminating competitive rules from Buddy Ball it differentiates it from other sports but creates a more positive and care-free environment. Through the years, Interact Club has taken new groups of excited students to participate in this volunteer opportunity. Buddy Ball gives students the chance to help their community and gain volunteer hours for Bright Futures or other similar programs. The special needs kids often return through the years and the students who stick with it can see them grow. Outside of the club, anyone can volunteer with the Buddy Ball program, as it is open every weekend for those who would like to help out. 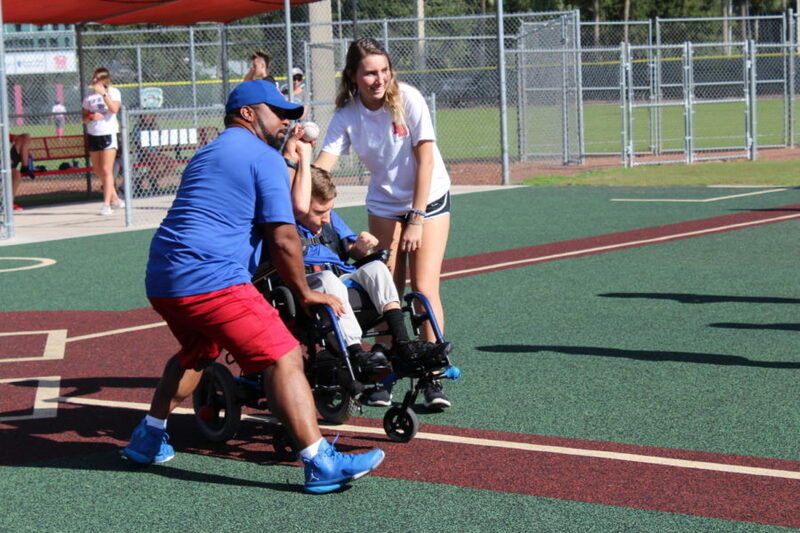 Junior Sara Vratanina assists a player in throwing the baseball to first base during Buddy Ball on Saturday October 20 at the Eastmonte baseball fields. The coach also helped the players hit the pitches when they were struggling.